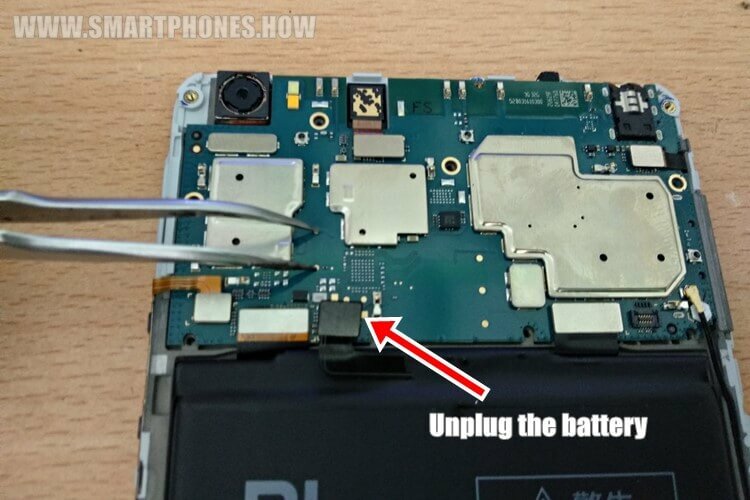 The reason why to do the test point when smartphone Max Mi boot loop or hard brick but the bootloader is locked so can not flash through Fastboot Mode. Actually, using a deep flash cable can make Xiaomi Mi Max 32 GB Hydrogen into Emergency Download Mode or known EDL. But if you do not have the tool, Test point can be a solution. Connect between one point to another like the picture above. Unplug the battery socket and connect the smartphone to the PC, then connect the two dots as shown above using tweezers or copper cables. After that check in the Ports section of your Windows Device Manager. Make sure Qualcomm HS-USD QDLoader 9008 is detected and flashing immediately. If Qualcomm 9008 is not detected, Install Qualcomm drivers and disable Driver Signature Enforcement if you are using Windows 8/10.